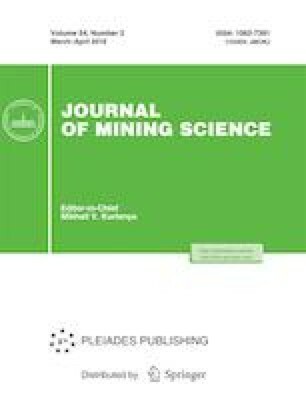 Physical modeling results on electromagnetic response of rock mass to low-energy impacts in the Tashtagol iron ore deposit are presented. It is found that multiple low-energy series of impacts initially increase the amplitudes of electromagnetic signals which later on decrease to the same level. This circumstance is indicative of the fact that the slowly varying levels of electromagnetic signals recorded after large-scale blasts are governed by displacements of rocks on various slip planes. The changes in the stress–strain state of rocks proceed slowly taking from units to tens of hours. Original Russian Text © A.A. Bespal’ko, L.V. Yavorovich, A.A. Eremenko, V.A. Shtirts, 2018, published in Fiziko-Tekhnicheskie Problemy Razrabotki Poleznykh Iskopaemykh, 2018, No. 2, pp. 10–17.